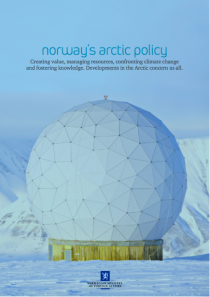 The report “Norway’s arctic policy: Creating value, managing resources, confronting climate change and fostering knowledge. Developments in the Arctic concern us all.” was presented by Prime Minister Erna Solberg and Minister of Foreign Affairs, Børge Brende in the city of Hammerfest 10 November 2014. Read full report here: Norway’s Arctic Policy. Read the summary of the report.